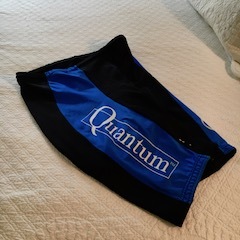 From the drawer where I keep riding shorts these surfaced for today. I wore them while riding this afternoon. They’re about 27 years old. 27 years old and still holding up. Granted, I have lots of riding shorts. Even so, I wear them once before washing. If I ride twice a day, that means two pair of shorts per day. I go through a lot of riding shorts. The brand of these shorts is Louis Garneau. I’ve worn his brand since the mid-80s (yes the 1980s) when Nestor Gernay would order our cycling team kits from Louis Garneau. When we put together cycling kits for the Healthdyne Technologies Cycling Team in the 90’s I ordered them from Louis Garneau. These are those shorts. Nestor Gernay and me (in the red jersey). Winter time training in Savannah, GA around 2000. Now, Louis Garneau may or may not make shirts for archery. What I do know is that his apparel lasts.